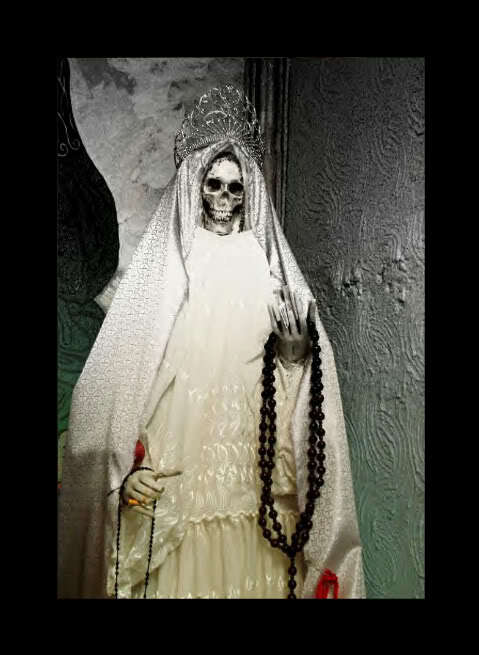 Santa Muerte is a deity or saint-like figure worshiped or venerated in Mexico, probably a syncretism between Mesoamericanand Catholic beliefs. The name literally translates to “Saint Death.” Mexican culture since pre-Hispanic times has always maintained a certain reverence towards death, which can be seen in the widespread Mexican celebration of the syncreticDay of the Dead. Catholic elements of that celebration include the use of skeletons to remind people of their mortality. Santa Muerte generally appears as a skeletal figure, clad in a long robe and carrying one or more objects, usually a scytheand a globe. The robe is most often white, but images of the figure vary widely from person to person and according to the rite being performed or the petition of the devotee. As the worship of this deity was clandestine until recently, most prayers and other rites are done privately in the home. However, for the past ten years or so, worship has become more public, especially in Mexico City. The cult is condemned by the Catholic Church in Mexico, but it is firmly entrenched among Mexico’s lower classes and criminal worlds. The number of believers in the deity has grown over the past ten to twenty years, to approximately two million followers in Mexico and has crossed the border into Mexican communities in the United States. Trailer for the documentary Saint Death (La Santa Muerte), directed and produced by Eva Aridjis, narrated by Gael García Bernal, distributed by Seventh Art Releasing. 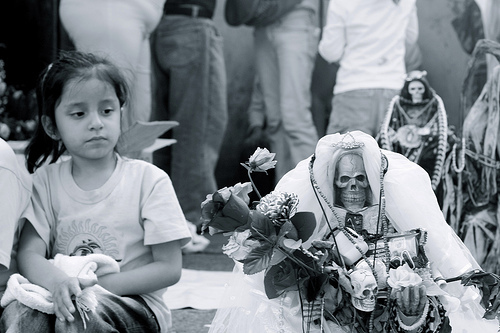 Film synopsis: In Mexico there is a cult that is rapidly growing- the cult of Saint Death. This female grim reaper, considered a saint by followers but Satanic by the Catholic Church, is worshipped by people whose lives are filled with danger and/or violence- criminals, gang members, transvestites, sick people, drug addicts, and families living in rough neighborhoods. 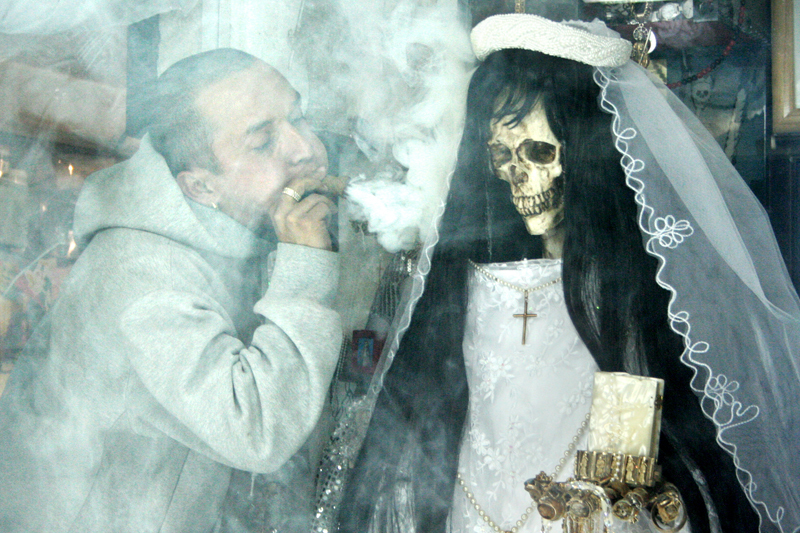 “La Santa Muerte” examines the origins of the cult and takes us on a tour of the altars, jails, and neighborhoods in Mexico where the saint’s most devoted followers can be found.